Breathe in, breathe out.... - Stop staring and start sewing! Not much going on around here. We're just relaxing and enjoying the beautiful Arizona winter (it was 80 degrees last week) and for the time being nobody has the flu or a cold or anything else. Nice. I was able to sit down and work out a quilt square for Leslie and I'm really happy with the results! 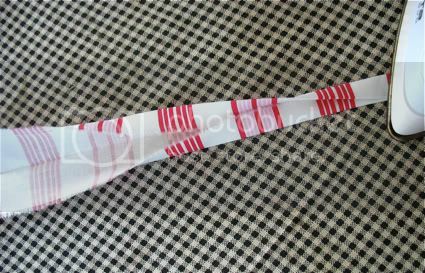 I just cut all the fabric into 1.5" wide strips and then sewed them together in one loooong strip. Then I cut it into 13" segments and stacked them up and topped it all of with flower appliques (then trimmed it down to 12" x 12"). 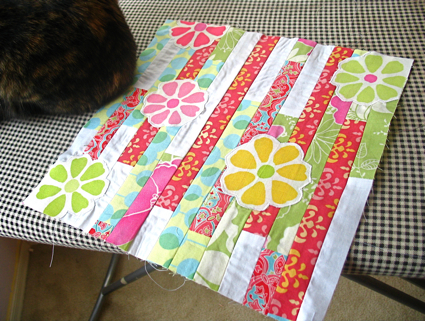 I'm really enjoying being part of a virtual quilting bee. It's a little bit challenging without being too stressful. I need to run over there and post something. And Kim posted some good news on True Up! Westminster is suspending implementation of their policy that would require all stores to list their fabric at the full recommended retail price (wouldn't that mean it's a required retail price, and not recommended?). That's a nice reprieve anyway. Unfortunately with their new price increase and the increased cost of postage from the USPS I'm still going to have to increase my prices but it won't be as bad as I had initially feared. So that's that. I had a chance to play around with an idea today and I thought I'd share it. My little Sofia (she's 12, so she's turning into a big girl, but she's still my littlest girl) likes to make little pouches for her friends and then fill them with goodies (sometimes for birthdays, and sometimes just because it's fun to surprise people). 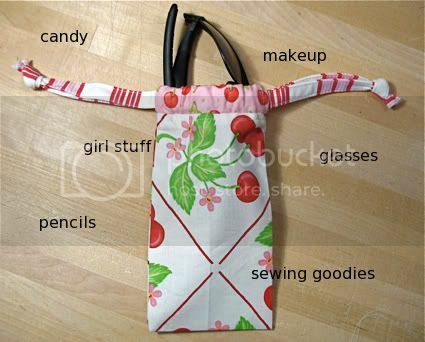 It's such a cute little idea but her pouches need a little fine-tuning so I put together a little tutorial for her (and had a chance to play with the Oh Cherry Oh fabric!). 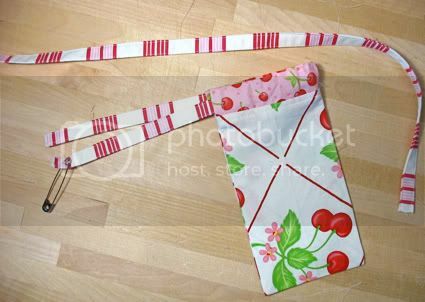 It just takes 3 pieces of fabric, but making the drawstring (the striped fabric) is optional. 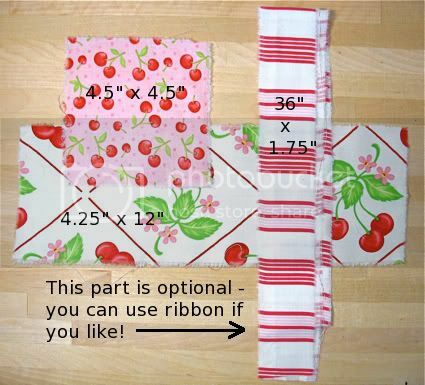 Use ribbon (2 pieces cut into 18" lengths) if you want to save yourself some time. 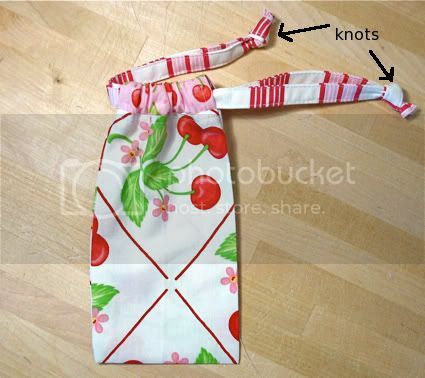 Stitch your drawstring closed (I usually stitch on the folded side too). 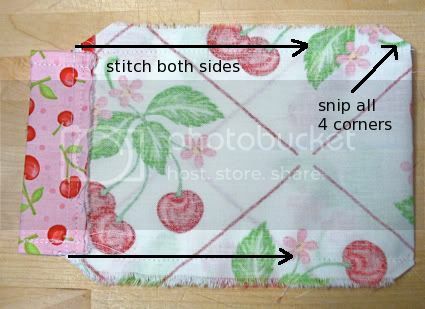 Then make narrow hems on two opposite sides of your square fabric piece (this makes your casings). 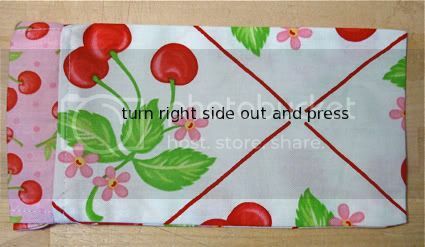 Cut your square casing piece into two equal pieces by folding in half (to determine the middle) and then cutting in two. Fold the casing pieces over and press. Center a piece on each end of the long fabric (match up raw edges) and stitch in place (I used about a 1/3" seam allowance). 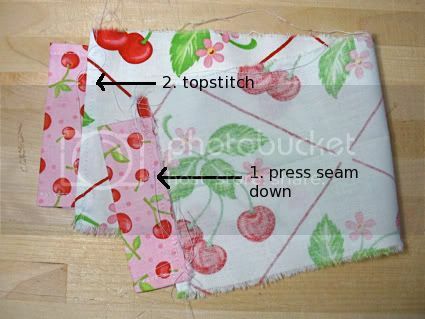 Press the seam allowances down and then topstitch. 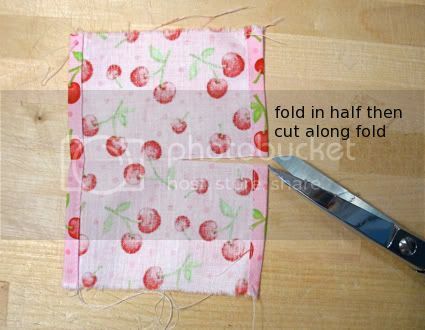 Fold in half and then sew your pouch shut by stitching each side starting right next to the casing fabric. Trim your corners by snipping at an angle. Flip right side out. Nice! 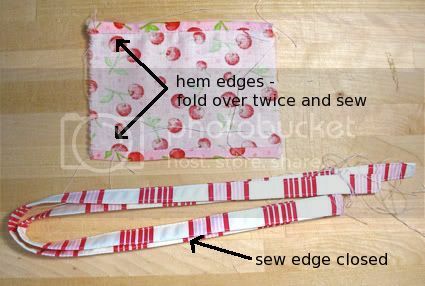 Now cut your drawstring in half and pull the first piece through the casings (enter and exit the left side). Then pull the second drawstring through (enter and exit on the right side). Tie knots on the end and trim them. Cute! I'm not sure what you can use it for, but my sunglasses fit in this one quite nicely! There are some great new posts on the CPSIA here and here (and a facebook group here). It's coming down to the wire (it's supposed to be enforced beginning Feb 10th) and hopefully people are starting to make some noise. I called Senator Henry Waxman yesterday and asked him (well I asked the guy who answered the phone to relay my message) to please delay implimentation until they can "re-work" this bill (which is destroying small businesses across our country). If you'd like to give Mr. Waxman your 2 cents, his number is (202) 225-3976. I'm going to make it a point to call at least one representative a day about this bill until February 10th. I am woman, hear me roar!